Sometimes the ingredients that are only available for a short period of time are even more fascinating and intriguing than those that you see more throughout the year. Jerusalem artichokes definitely belong to this category of more rare veggies and I go mad about them as soon as I first see them hitting the markets. I think this delicious root vegetable is actually a bit misunderstood and underrated. Packed with iron, Jerusalem artichokes are a perfect veggie to add into your everyday meals, so embrace these gems and make most of them when they are available. This simple dish is a celebration of seasonal flavours. I've adapted Terry Walter's recipe and I think this is a superbly delicious way to savour Jerusalem artichokes. I've pared them with garlic, lemon and fresh rosemary and served with baby spinach and toasted pecans this makes a delicious lunch for one or a nice side dish for two. 1. Peel the Jerusalem artichokes and cut into thin slices. 2. Heat the olive oil in a frying pan. Add the sunchokes and fry for 2-3 minutes. 3. Add the garlic, rosemary and lemon juice and continue to sauté for a few minutes. Add a tablespoon or two of water to deglaze the pan. Season with salt and pepper. 4. 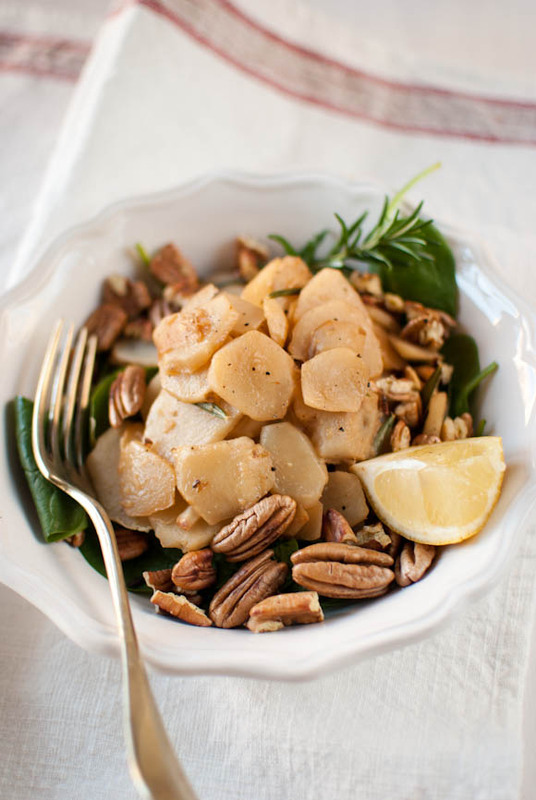 Serve the Jerusalem artichokes with baby spinach and pecans. I love the before and after pictures. This looks like something I am definitely going to try. As good as Jerusalem artichokes are, it's the pecans that make this dish shine for me. I adore them! This looks awesome! I never know what to do with jerusalem artichokes. Love the flavors here. This side looks awesome! Will try the recipe soon. Damn it. Just saw that photo and now I must must must have some pecans. I don't think I've ever had these before but will be on the look out! Love the simplicity of the recipe! wow they look amazing and funny, I dont think Ive ever had them!? today i bought white nectarines. another of those "only lasts a few weeks but when they're in season they're heavenly" type foods ! you're kidding! those look like ginger roots, even cut up! Looks new and very interesting! That surely looks very interesting and delicious dish. They are looking amazing at the markets aren't they! That is one original dish! I really like that pairing. 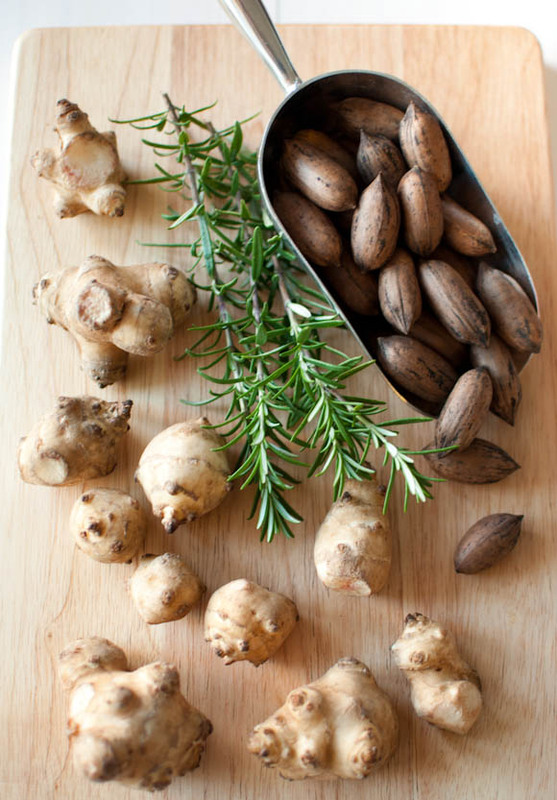 I've used Jerusalem artichokes together with hazelnuts, but never tries serving them with pecans. Yummy! Such a great way to use them, how appealing and fresh! Lovely. What healthy and refreshing spread! You are lucky to get such exotic and unusual ingredients to cook with. Jerusalem artichokes are something completely new to me. You always find the most interesting and wholesome ingredients! A perfect picnic dish- fresh and clean. They almost look like ginger when unpeeled and water chestnuts when served. Amazing. I have never had the pleasure to cook with Jerusalem artichokes before but your dish looks so good I might have to get me some at all costs! I am on the search! Oh and I have a AWESOME Olive Oil Giveaway on my blog today. the company DEVO has so many difference infused flavors to choose from. You would love this so be sure to stop by and tell everyone you can ! Very interesting simple yet wonderful dish, love the flavors added! I see Jerusalem artichokes at the farmer's market all the time and I've never bought one! I am SO making this dish! I thought Jerusalem artichokes look like ginger when I first saw it. It's my first time seeing it. I like how you turn those ingredients into a beautiful dish!!! What an unusual but lovely combination, I have only ever put jerusalem artichokes in soup but this looks great. I've never tried jerusalem artichokes, but they sure look mighty delicious! I can see how they'd work really well with the toasted pecans though! That looks really delicious. I love your blog. I always learn and see some new dishes!! I love jerusalem artichokes, but can't seem to find them at the market. I'll have to look a bit harder so I can make this great looking dish!